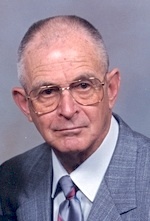 Dale Frederick Sawyer, Sr., 95, of Gardner, passed away Nov. 17, 2015 at Eudora Medical Lodge. Visitation 1:00 pm before the Funeral Service which will be held 2:00 pm Mon., Nov. 23, 2015 at Bruce Funeral Home, Gardner, KS (913) 856-7111. Burial follows at Gardner Cemetery. Memorial contributions may be made to First Presbyterian Church of Gardner or Gardner Cemetery. Dale was born October 25, 1920 in rural Gardner to Fred S. and Lola M. (Kennedy) Sawyer. He was a life-long area resident who graduated from Gardner High School in 1939. Dale married Hildred Pauline Hittle on April 2, 1941 in Harrisonville, MO. He was a proud, dedicated, hardworking farmer and stockman. Dale’s success in his profession can be attributed to his keen eye for detail and organization, everything was well thought out. Dale did a lot of figuring on barn boards, feed sacks, ledgers, envelopes, etc. He was the first of the Sawyer brothers to buy and own an Allis Chalmers combine. Dale was head custodian and mail courier at Gardner Elementary from 1980-1988. He was an elder and trustee at First Presbyterian Church of Gardner, served on the Water District #7 Water Board and on the Gardner Edgerton School Board from 1965-1969. Dale was the sexton for the Gardner Cemetery for 17 years from 1989-2006 where he supervised 525 burials. He will be missed by family and friends. He was preceded in death by his parents; four brothers, Otto, Floyd, Vernon, and Harold; two sisters, Lucille Knabe and infant sister, Lillian. Dale is survived by Hildred his devoted wife of 74 years; son, Dale F. Sawyer, Jr. and his wife Judy, Lawrence, KS; daughters, Diana C. and husband Gerald Lefmann, Pensacola, FL and Kaye and James Baty, Kansas City, KS; sister, Nadine Larrick, Gardner, KS; brother, LaVerne Sawyer, Wellsville, KS; five grandchildren, Angie, Sherri, Jenny, Steve and Kala and three great-grandsons.